This is the future database for the Kentucky Arches Database, similar to the Kentucky Waterfall Database. Kentucky is said to rank 2nd or 3rd in the United States for arches. There are currently around 1500 documented arches in the state. That would make Kentucky 2nd to only the 4000+ documented arches of Utah. To search out and find arches in the state of Kentucky is vastly different than the western states that lack the hollows, canopy and thick forest of the bluegrass. •There is Steve Martin's database at KGS's website (University of Kentucky). It is a GIS map of arches that mainly he has been to and documented. It includes some detailed information about the arches and includes several pictures of each arch. There may or may not be arches from other's included on his map. He gives you his information to submit arches to his & KGS's database on his website. His map mainly has arches for the Red River Gorge but also includes several for other areas of the state including Carter Caves State Resort Park. •There are quite a few arches labeled as 'Natural Arch' on the old USGS topographical maps. 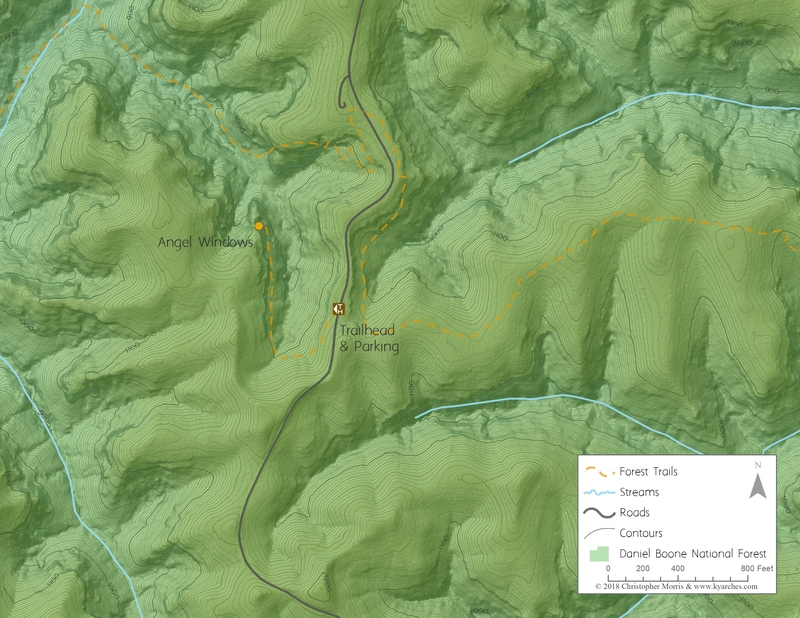 The maps or quads are available from the USGS and must be searched to find said arches. Even then, rarely is the common or historical name given for the arch. •Tom Dunigan has a great database for Tennessee Landforms. 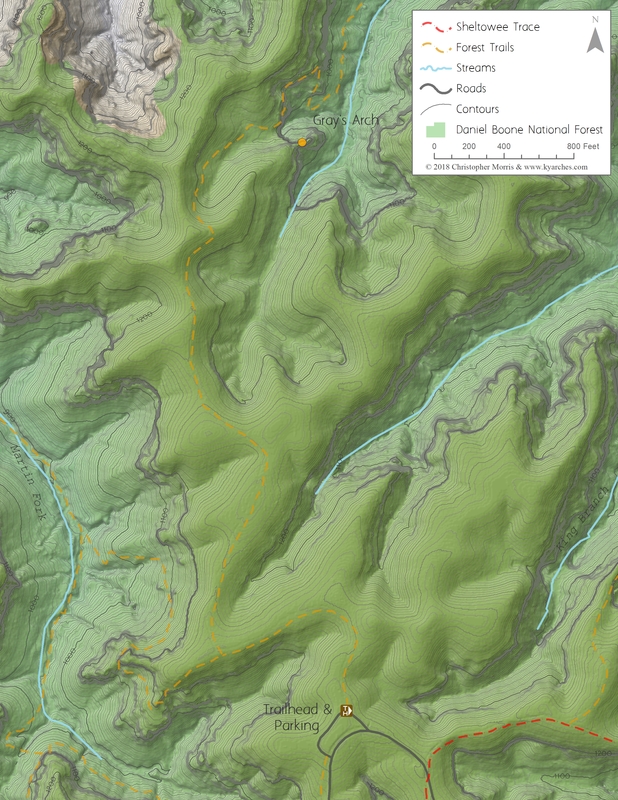 Part of his database includes all the known/submitted landforms for the Big South Fork NRRA. 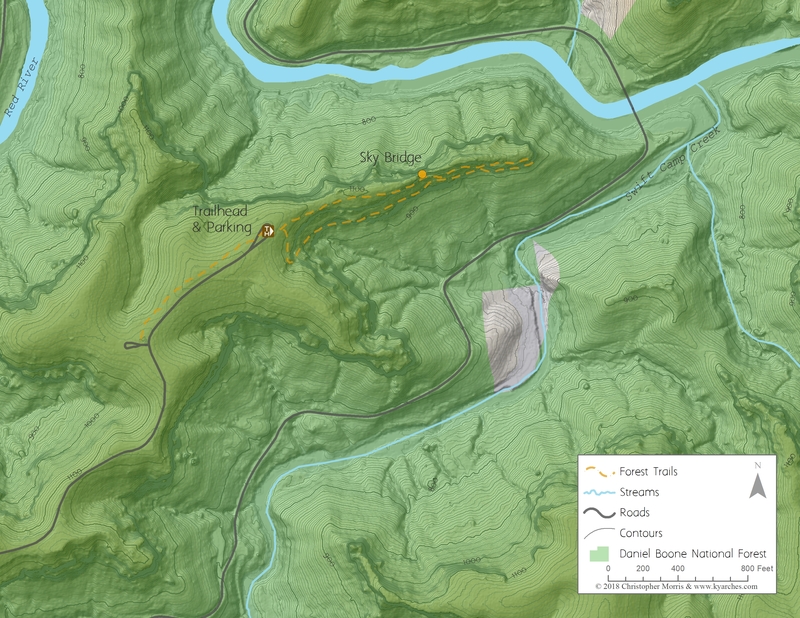 His database for the Big South Fork includes both the Kentucky and Tennessee landforms of the park, which includes arches. •There is also Bill Patrick's database of the over 600 documented arches in the Red River Gorge Geological Area. His database is in the form of 7 DVDs (currently). There is no better resource for arches in the RRG area than Bill's DVDs. It is one of the most thorough and best databases for an area in the nation. His DVDs include pictures, videos, names, GPS coordinates, maps with directions, information about the size, elevation, history and other pertinent information about each arch. •There are several publications available listing Kentucky Arches. They are generally older and black and white photocopies. •NABS, the Natural Arch & Bridge Society has a few hundred arches documented in their database for the state. Nothing near the totality of even the arches of the Gorge, let alone the whole state. •There is also the World Arch Database that includes some arches for Kentucky. 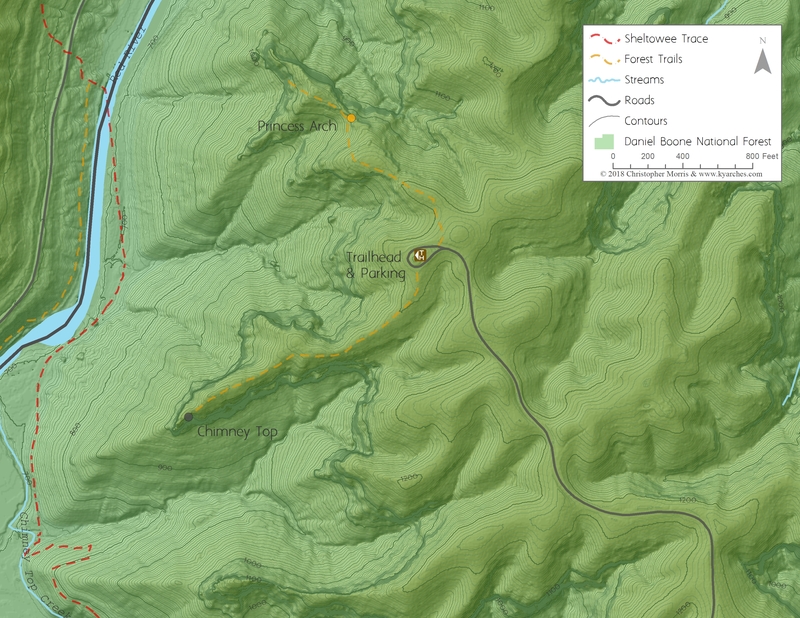 The area outside of the gorge is sparsely documented online in any format. 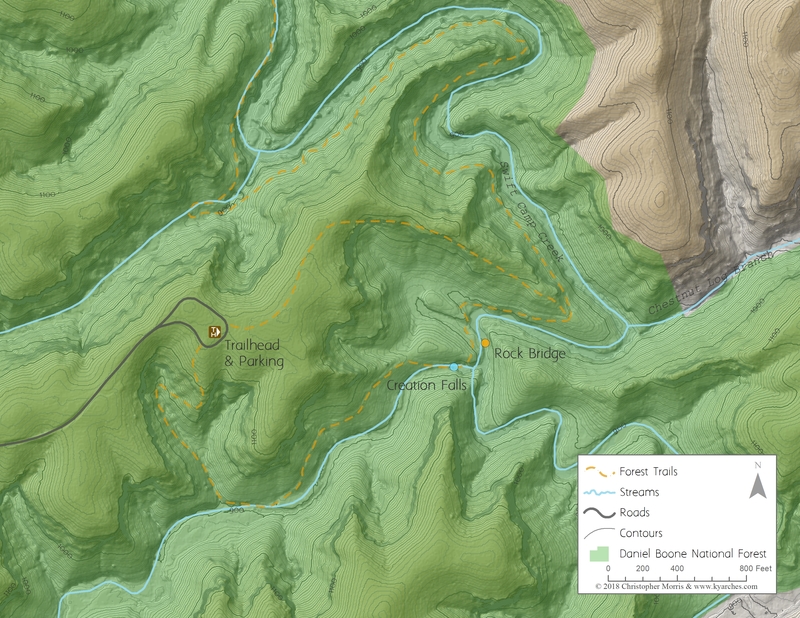 There are arches shown on local park maps, known by the forest service or locals that are not available to the arch hunter to go find and experience themselves. That is part of the mission of this website. This website will never be a one-stop shop for all arches located within Kentucky. The Gorge is covered in great detail by Bill already and does not need to be reproduced here.